Golf Wantilan Villa Several magnificent 4-bedroom and 3-bedroom villas within this community are available for short-term rental, offering a holiday experience that is more private, more relaxing, and more enjoyable than staying at a hotel. Gently nestled within a secluded enclave, yet only a short stroll from the Bali Golf Clubhouse, the ocean, and all of the restaurants, shops and other resort facilities in Nusa Dua, the Wantilan Golf Villas offer the perfect balance of privacy, tranquility, recreation and convenience. Golf lovers will enjoy the immediate accessibility to The Bali Golf and Country Club, and the priority tee-times, discounted green fees, and other privileges extended to guests of the Wantilan Golf Villas. All guests of the Wantilan Golf Villas also enjoy exclusive access to the private Amanusa Beach Club. Room massage services are available from The Spa at Bali Golf and Country Club professionally managed by Mandara Spa. Each Wantilan Golf Villa can comfortably accommodate large families and small groups of golfers or executives, and is an ideal setting for hosting intimate gatherings, receptions and meetings. Guests may choose to rent an entire 3 or 4-bedroom villa, or an individual free-standing guest bedroom within a villa. Each of the 4-bedroom villas is situated on over 3,000 square meters of lushly landscaped land, and the 3-bedroom villa is situated on nearly 2,000 square meters. Each of the villas has a private swimming pool and jacuzzi with a full sun deck, private open-air living and dining pavilions, and separate staff quarters that include a fully-equipped kitchen. Each bedroom is free-standing and detached with its own private bathroom and bathing and shower facilities. This allows a level of privacy far greather than in a hotel room. Each master bedroom has a separate shower and private outdoor bath surrounded by a lotus pond. Each guest bedroom has an indoor bath and both an indoor and private outdoor shower. Each of the bedrooms is fully air-conditioned, tastefully furnished with original Indonesian antiques and artifacts, king-sized bed, sitting area, desk, and a separate dressing area with double vanity. All of the master bedrooms and virtually all of the guest bedrooms have their own private open-air garden gazebo with day bed ideal for intimate relaxation. Each bedroom is equipped with a television, international direct dial telephone, mini-bar and stereo compact disc player. Each master bedroom and living pavilion is equipped with both a television and video compact disc player for enjoying movies. Each villa is fully serviced to ensure the maximum level of comfort and relaxation. A full household staff is provided 24 hours per day. Each villa has a personal cook who is standing by from 7 a.m. to 11 p.m. to prepare meals either from our menu or cooked to the guests' specific order. A car and personal driver is also provided at no charge (including gasoline and insurance) with the rental of a full villa (excluding certain promotional specials). Each villa has a personal cook who is standing by from 7 a.m. to 11 p.m. to prepare meals either from our menu or cooked to the guests' specific order. We can provide private catered meals served at the Wantilan Golf Villas for small groups and gatherings. Entertainment, including Balinese cultural show, live music and Batavia Keroncong band can be arranged during or after a catered meal. 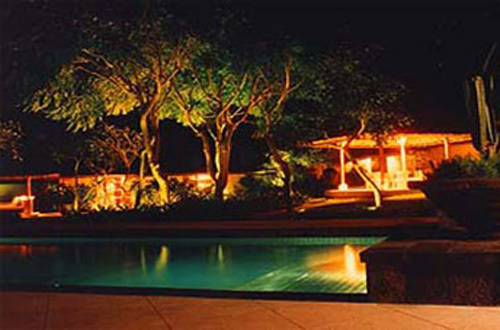 Indonesian, western and seafood barbeques are particular favorites of our guests at Wantilan Golf Villas. This casual café is situated at the ground level of the clubhouse and is open from 6:00 a.m. to 7:00 p.m. The menu features fresh juices, energetic drinks and light meals. An elegant open-air dining room located at the second level of the clubhouse overlooking the Indian ocean & golf course. The menu features salads and entrees, local and international favorites, snacks and desserts accompanied by fine wines. Open from 10:00 a.m. to 5 p.m. The Clubhouse at Bali Golf and Country Club offers the perfect setting for catered banquets and entertainment. Whether you hold your event poolside or at our beautiful outdoor Clubhouse restaurant overlooking the ocean, you'll find our Clubhouse the ideal venue for dinners under the stars, tournament award ceremonies, luncheons, business retreats, and other group functions (both small and large). A wide range of entertainment can be arranged for your event, including Balinese cultural shows and live Indonesian or western music.